Shri Tarun Shridhar, IAS, Secretary, Department of Animal Husbandry, Dairy and Fisheries (DADF) under Ministry of Agriculture and Farmers’ Welfare, Government of India visited ICAR-CIFT, Cochin along with Shri K.S. Srinivas, IAS, Chairman, MPEDA, Cochin. Reminiscing his long association with fisheries sector, the Secretary lauded the research accomplishments of ICAR-CIFT for its outstanding research in harvest and post harvest sectors in fisheries and suggested for pluralistic convergence of different agencies working in the same line to bring more visibility in the fisheries sector and to check unnecessary wastage of resources due to duplication of work. 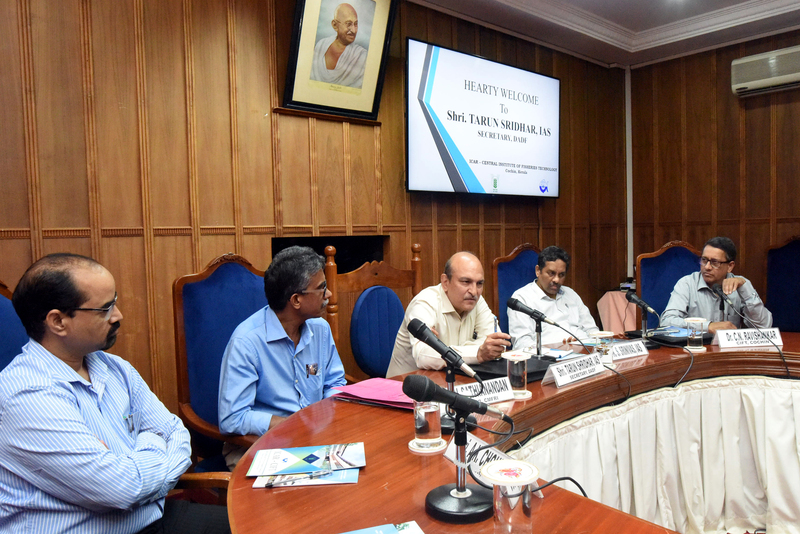 Citing the excellent contribution of ICAR in introducing the Vannami prawn culture and fish disease surveillance, he urged the stakeholders from both central and state governments for greater collaboration to strengthen the blue economy initiative of the government. 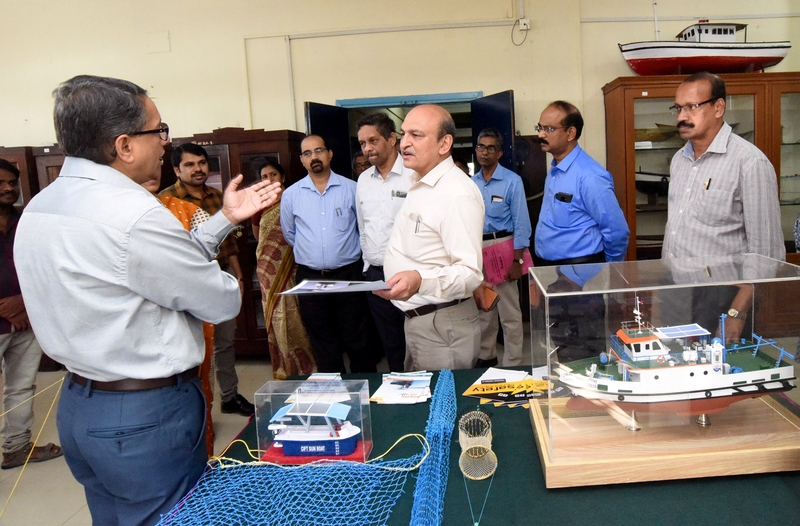 Later, he had an effective interaction with scientists from ICAR-CIFT, ICAR-CMFRI and CIFNET regarding the marine fishing regulations, responsible fisheries and food safety issues. He advised that MPEDA should take a lead to bring together all the stakeholders in the sector on quarterly basis to discuss about the strategic research developments in fisheries matching with need of the hour. Earlier, Dr. Ravishankar C.N., Director, ICAR-CIFT welcomed the gathering and highlighted the salient research achievements of ICAR-CIFT and their successful dissemination in the field. He sought the intervention of Department of Animal Husbandry, Dairying and Fisheries (DADF) to disseminate users’ friendly potential technologies of ICAR-CIFT across the country with the help of NFDB. Shri Srinivas in his remarks appreciated the contributions of ICAR-CIFT and ICAR-CMFRI and assured all possible support for the growth of the fisheries sector. Dr. T.V. Sathianandan, Director i/c. ICAR-CMFRI and Shri A.K. Chaudhary, Director, CIFNET were also on the dais.